Oscilloscopes in the new PicoScope 3000 series all feature a high-speed USB 2.0 interface, together with impressive sampling rates, high bandwidths and a large buffer memory. PicoScope oscilloscopes simply connect to the USB port on any standard Windows based PC, making full use of the PC'''s processing capabilities, large screens and familiar graphical user interfaces. PC oscilloscope owners looking for a scope that offers outstanding performance and ease of use, will find the PicoScope 3000 series the perfect choice. 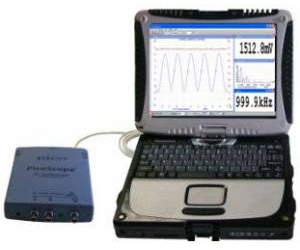 PicoScope oscilloscopes are supplied with PicoScope software (oscilloscope, spectrum analyzer, and meter). Also supplied is PicoLog data acquisition software that transforms your PC into a high-speed data logger. Ideal for use both in the lab or in the field, the PicoScope 3000 oscilloscope series is the perfect choice for users who demand high-performance and portability in an easy-to-use, low-cost package.